New Large Seminar Room Available! 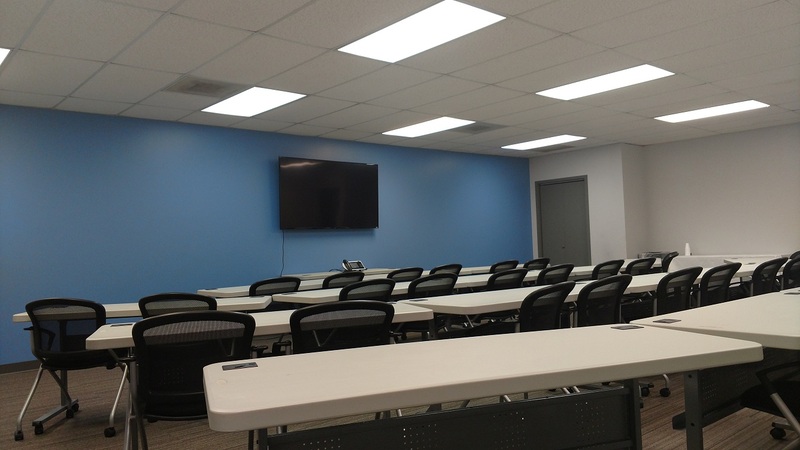 We are excited to announce the addition of a BRAND NEW workshop/training room to our Nashville Conference Center! Previously, we looked at our Reception Area makeover. Next, we updated our in-suite Meeting Room with new IKEA Bekant conference tables and black screen back plastic shell task chairs from The Classy Home. We had previously painted the white board wall in a deep purple accent color and added a modern print from art.com. 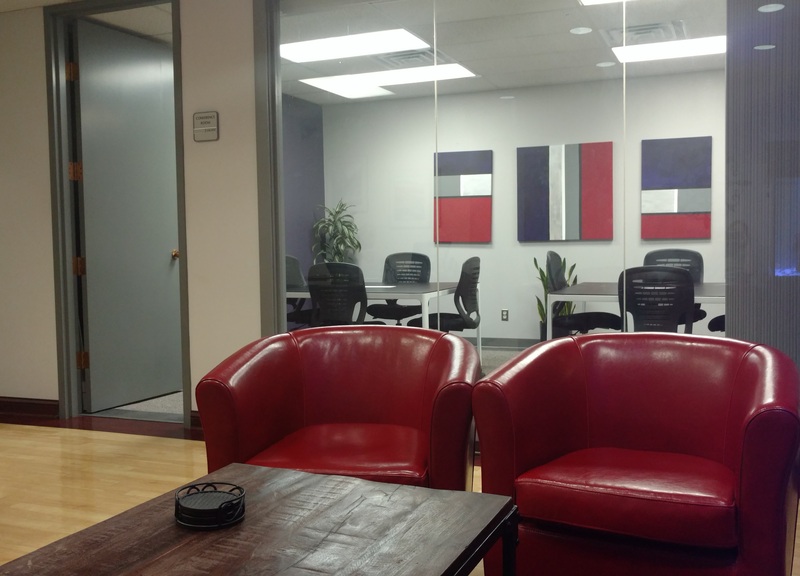 We couldn’t find artwork to tie in with our reception area scheme, so we bought canvases and acrylic paints from JoAnn and created our own modern artwork to tie the purple in the Meeting Room to the red in the Reception Area. The movable IKEA tables allow for several different room configurations, and the sleek modern furniture give the space a roomy feel. Extra stacking chairs offer seating for up to 16 people. 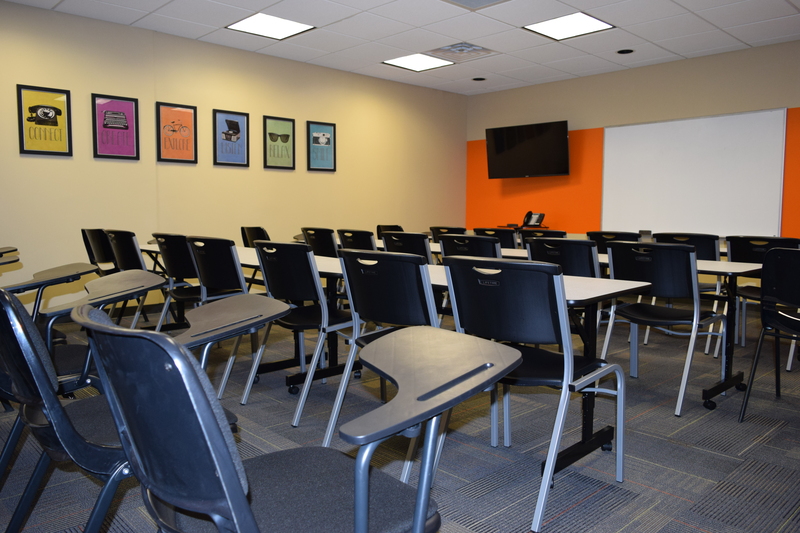 The multipurpose Meeting Room seats up to sixteen and includes two square Ikea desks, eight task chairs, and eight stackable extra chairs. It also includes a dry erase board. WiFi access and self-serve coffee available. 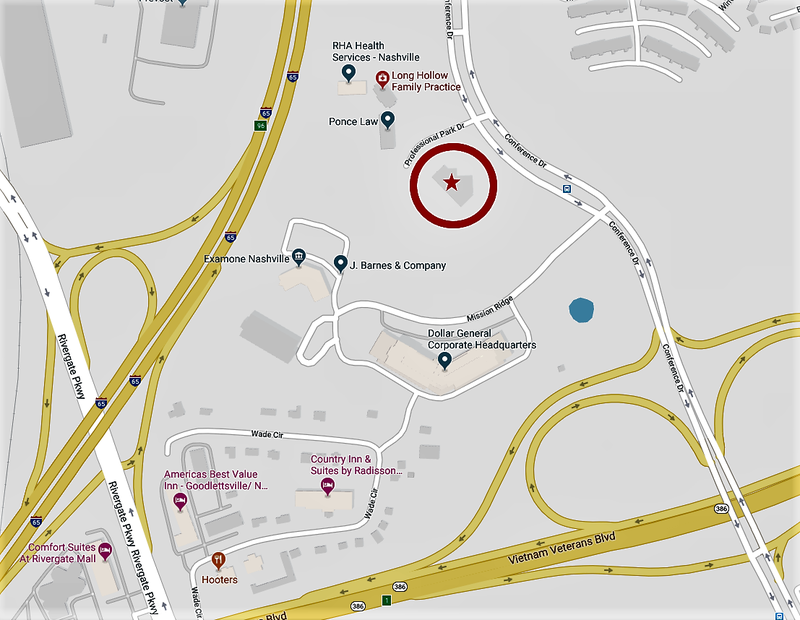 Last spring, Perimeter Park Executive Center had the opportunity to consolidate all of our offices and conference rooms onto the first floor of our building. Previously, we had occupied two floors and had a lot of unnecessary and underutilized space. Adding a new conference center area across the hall from our suite and designing our build-out for that space gave us an opportunity to update our facility with more modern technology and decor. The multipurpose Meeting Room seats up to sixteen and includes two square Ikea desks, eight task chairs, and eight extra stacking chairs. It also includes a dry erase board. WiFi access and self-serve coffee available. Named in memory of former employee Cheryl L. Tooley, this room seats six and is equipped with a roomy square Ikea table. It includes a dry erase board and wall-mounted 32″ flat screen TV with built-in DVD player. We had so much fun and received so many compliments on our new Nashville conference rooms that we decided to give the other common areas within our suite facelifts as well. And, honestly, we realized that some of our spaces appeared a little drab and outdated. They didn’t communicate who we were as a company, or the image we wanted to portray to our residents and their guests. We wanted to be purposeful and thoughtful about the environment we created. Our goal was to positively impact and inspire our residents who came here to work each day, as well as to make a positive impression on their clients and visitors. We are told that we have succeeded. We didn’t have a huge budget to work with, so we did one space at a time and focused on what would make the biggest difference and give us the most bang for our buck. New paint and a few new pieces of furniture go a long way! This blog series will chronicle some of the updates and changes we have made, starting with our reception area. We began by adding modern chairs in a bold red color from Overstock.com. A modern rug in red, gray, black, and white from The Home Depot anchored the chairs and tied in with our sleek, black saltwater aquarium by The Reef Doctor. 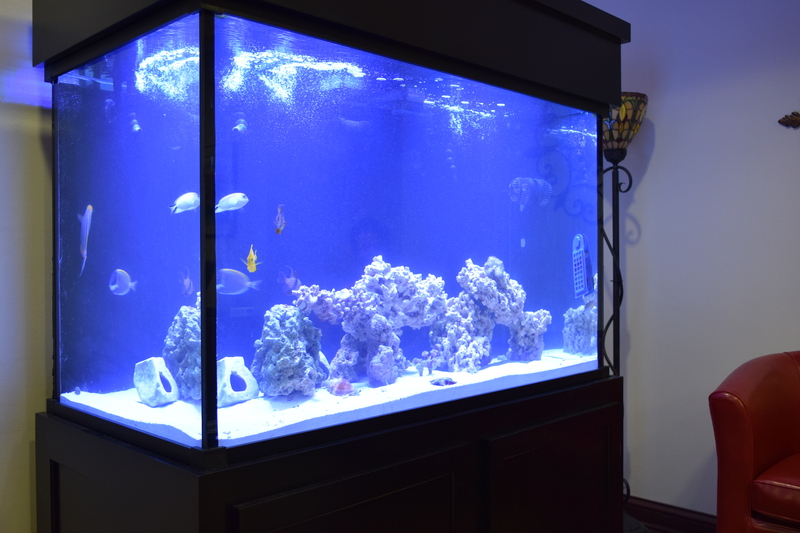 Out of all our changes, the aquarium has been the biggest hit with both our residents and their visitors. It has truly transformed our reception area into a tranquil, relaxing, and interesting place to visit. As a resident or virtual office client of Perimeter Park Executive Center, both you and your visitors will be able to enjoy our new reception area. 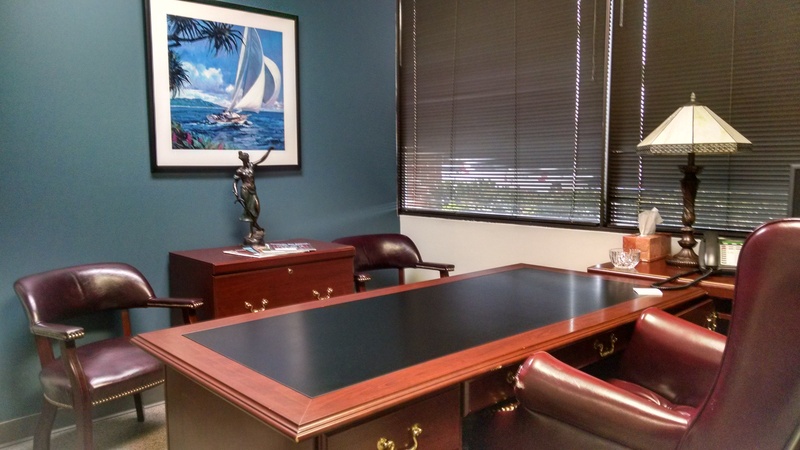 No other executive office space in Nashville offers a reception area with an experience! Come by to tour our facility and see for yourself! #Nashville Conference Center Open House TODAY! Come to our new #Nashville conference center open house TODAY from 3:00-5:30 p.m.